"God bless the music halls." — Sir Edward Elgar to Francis Colvin, letter of 14 March 1912. 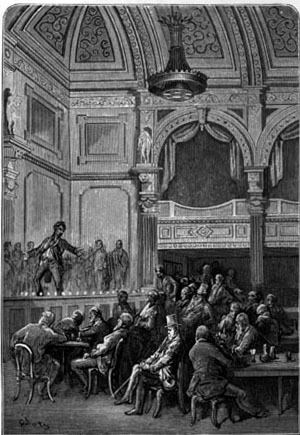 Gustave Doré's picture of a music hall from London: A Pilgrimage. The rise and spread of music halls in ninteenthy-century London helped to establish a revolutionary style of popular music. Part of the reason for the rapid growth of music halls was that the British Copyright Act of 1842 protected the reproduction and performance of music and gave an enormous stimulus to the music market, affecting writers, performers, and publishers. The tavern concert room became increasingly bigger and more independent until purpose-built halls arose. By the 1870s, a star system was in place, and among the celebrated performers of the latter part of the century were Marie Lloyd, George Leybourne, the Great MacDermott, Albert Chevalier, and Gus Elen. Music halls offered songs with hooks or catchy choruses, and downgraded the verses; these features were inherited by Tin Pan Alley, dance bands, show songs, and the "easy listening" repertoire. The songs could not be easily absorbed into the educational curriculum because they were too clearly indentified as the entertainment of an uncultured mass public; hence, educators condemned them as rubbish.The conviction behind Matthew Arnold's Culture and Anarchy (1869; full text), for example, was that only culture (that is, high culture) could save society from anarchy. Culture, for Arnold, is not a broad term: he spares no time on the music hall. The working class was thought to need "rational amusement" such as choirs. A rich cast of characters populated the stages of the music halls. The dandified toff or "swell" of the 1860s appealed to socially aspiring lower-middle-class males. Leybourne, the most acclaimed of the swells, was given a contract in 1868, at the height of his success with the song "Champagne Charlie," which made it a condition that he continue his swell persona offstage. The swell, however, is double-coded: he might inscribe admiration for wealth and status, but he subverts bourgeois values in celebrating excess and idleness ("A noise all night, in bed all day and swimming in Champagne," boasts Charlie). The supposed working-class authenticity of the music-hall experience has been much debated. A prime example of conflating the real and the imaginary in the 1890s was the portrayal on stage and in song of the Cockney, often a costermonger. Costermongers — or, more familiarly, costers — were itinerant street traders who usually sold fruit or vegetables from a donkey-drawn barrow (the name was derived from costard, a type of apple). From the 1840s to the 1890s the representation of the Cockney goes through three successive phases: it begins with parody, moves to the character-type, and ends with the imagined real. In this final phase, the stage representation is no longer derived from the flesh-and-blood Cockney; instead, it consists of a replication of an already existing representation. There is, from the late 1870s onward, a concern to encourage imperialist enthusiasm among the working class in Britain. The tenor of imperialist songs changes as a consequence. The avoidance of florid metaphor and, instead, the use of vernacular speech, as found, for example, in Kipling's Barrack-Room Ballads, contrasts markedly with earlier songs. Plain,tough-speaking imperialism is found in the music hall, most notoriously with "Macdermott's War Song" (G.W. Hunt), the refrain of which — "we don't want to fight, but by jingo if we do" — gave the new aggression the label "jingoism." John Hobson, in his Psychology of Jingoism (1901), accused music hall of stoking up imperialist sentiment, finding this a main reason for the lack of substantial opposition to the Boer War. However, as one century gave way to another, a further change occurred in this song repertoire. "Land of Hope and Glory," whose lyrics were wed to Elgar's first Pomp and Circumstance March, expresses a very different sentiment than "Macdermott's War Song." The music halls espoused the values of the upper-working-class or lower middle-class male, rather than those of the lowest social rank.The performers themselves were of a mixed class background: of the lions comiques in London, for example, George Leybourne had been a mechanic and the Great MacDermott a bricklayer, but the Great Vance was formerly a solicitor's clerk. West End halls, like the Oxford, were the only ones to attract higher-class patrons; suburban halls relied on patronage from the working class and lower middle class (tradesmen, shopkeepers, mechanics, clerks). Charles Morion had difficulty trying to encourage the middle class to attend his grand hall, the Canterbury, in Lambeth. Left: Cover for "mischief," which Lloyd sang in 1891. Right: Marie Lloyd. The halls frequently gave rise to fears concerning public morality. London audiences, however, defended their moral values when the law was used in a repressive manner, turning up in large numbers at the halls, at law courts and licensing sessions, and writing letters and petitions. Sometimes, the problems involved prostitution in or around the halls; at other times, it might be the lewd content of a song or dance. The most difficult thing for moral guardians to control was the physicality of certain performers, the most notorious being Marie Lloyd, who used gestures, winks, and knowing smiles to lend suggestiveness to the most "innocent" of songs. In the 1890s, middle-class attitudes became more favorable to music hall, swayed by the managers'efforts to ensure respectability. The managers had noted the success of respectable vaudeville in New York in attracting a family audience into theaters. At the same time, we must recognize that efforts to increase the social mix of music-hall audiences in the later nineteenth century were helped to a great extent by the widespread enthusiasm for imperialism. It is surely more than coincidence that, from the 1890s on, the music halls under the ownership of Edward Moss all bore the name "Empire."